Mindfulness is effective for reducing anxiety and depression and increasing chronic disease self-management. An accessible, insurance-reimbursable model for implementation in patient-centered medical homes within US healthcare systems has promise for patients with multi-morbid conditions. Clarifying both the dose needed to impact anxiety, depression and self-management, and the design requirements for accessible primary care implementation, is essential. 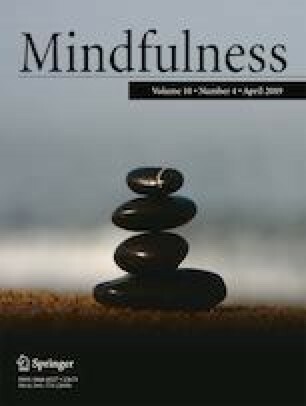 We tested feasibility, acceptability, and effectiveness of Mindfulness Training for Primary Care (MTPC), an 8-week, referral-based, insurance-reimbursable mindfulness program integrated within primary care, compared with a Low-Dose Comparator (LDC), consisting of a 60-minute mindfulness introduction plus referral to community and digital resources. Outcome measures were assessed at baseline and 8 weeks. MTPC is trauma-informed, incorporates mindfulness-oriented behavior change skills, and is designed to target anxiety, depression, stress, and chronic illness self-management. Participants scheduled a PCP visit to co-create a self-management action plan during week 6. Primary care providers (PCP) referred 344 patients over 14 months. Eighty-one participants with DSM-V anxiety disorders, depressive disorders, trauma- and stress-related disorders participated in this pilot randomized-controlled comparative effectiveness trial [MTPC (n=54); LDC (n=27)]. These data suggest that MTPC was more effective than LDC for reducing anxiety (p=0.01), enhancing mindfulness (p=0.02) and self-compassion (p=0.001), and for catalyzing self-management behavior change through action plan initiation (OR=4.34, p=0.03). MTPC was successfully integrated into a health system, was billed to insurance, and was acceptable to a diverse primary care population. Replication with a larger study and further accessibility adaptations are needed to confirm and expand these pilot results. The online version of this article ( https://doi.org/10.1007/s12671-019-01116-8) contains supplementary material, which is available to authorized users. The following individuals are acknowledged: Susan Pollak, Alexandra Oxnard, Laura Warren, Paula Gardiner, Eric Loucks, Timothy Martin, Fabio Marcovski, My Ngoc To, Thomas Fatkin, Alexandra Brunel, Bridget Kiley, Pedro Barbosa, Jillian Burley, Cristian Onofrei, Barbara Hamm, Janet Yassen, Nicholas Barnes, Chris Carter-Husk, Nayla Khoury, Alaine Fredericksen, David Lovas, Emily Benedetto, Colleen O’Brien, Robert Joseph, Michael Williams, Mark Albanese, Adam Elias, Somava Stout, Elizabeth Gaufberg, Ben Cook, David Bor, Randy Wertheimer, Assaad Sayah, Jay Burke, and Patrick Wardell. RG: edited intervention, oversaw and executed the study, analyzed the results, co-wrote the manuscript; EP: co-designed intervention, designed and executed the study, assisted with data analyses, edited the introduction and methods; TG: co-designed intervention, designed and oversaw the study, co-wrote the introduction, methods and discussion; TC: analyzed results, edited the methods and results; ZV: co-designed intervention and oversaw supervision of intervention group leaders, edited the methods; ER: co-designed and oversaw supervision of the intervention group leaders, edited the methods; AL: executed study, led patient focus group, and edited the manuscript; ZSO: co-designed intervention, designed and oversaw the execution of the study, co-wrote the manuscript. All authors approved the final version of the manuscript for submission. This study was supported by the National Institutes of Health (NIH) Science of Behavior Change Common Fund Program through an award administered by the National Center for Complementary and Integrative Health (NCCIH) (UH2AT009145), as well as The Arthur Vining Davis Foundations—Healthcare System Transformation Grant, The Arnold P. Gold Foundation, Cambridge Health Alliance, and Harvard Medical School Department of Psychiatry. This study was approved by the Cambridge Health Alliance Institutional Review Board and procedures followed all provisions of the Declaration of Helsinki. Partial data from initial analysis was presented to scientific advisory board for NIH Science of Behavior Change Network Meeting, Bethesda, MD (January 10, 2017). American College of Medical Quality. (2010). Definition and Application of Medical Necessity. Retrieved from http://www.acmq.org/policies/policy8.pdf. Bor, D. (2017). Cambridge Health Alliance: 2017 Academic Overview Retrieved from https://static1.squarespace.com/static/59271313e3df289d83dde161/t/59ef5987cd39c3bc41164c8c/1508858257512/2017+Academic+Overview.+Final+10.18.17+%281%29.pdf. Accessed December 2018. Chong, J., Reinschmidt, K. M., & Moreno, F. A. (2010). Symptoms of depression in a Hispanic primary care population with and without chronic medical illnesses. Primary Care Companion to The Journal of Clinical Psychiatry, 12(3). https://doi.org/10.4088/PCC.09m00846blu. Croghan, T.W., Brown, J.D. (2010). Integrating Mental Health Treatment Into the Patient Centered Medical Home (Prepared by Mathematica Policy Research under Contract No. HHSA290200900019I TO2). Retrieved from https://pcmh.ahrq.gov/page/integrating-mental-health-treatment-patient-centered-medical-home. AHRQ Publication No. 10-0084-EF, Rockville, MD: Agency for Healthcare Research and Quality. Accessed March 2015. Disease Control and Prevention, C. f (2018). About chronic diseases. Retrieved from https://www.cdc.gov/chronicdisease/about/index.htm. Accessed November 2018. Fenn, K., & Byrne, M. (2013). The key principles of cognitive behavioural therapy. 6(9), 579–585. doi: https://doi.org/10.1177/1755738012471029. Kanaan, S. (2008). Promoting effective self-management approaches to improve chronic disease care: lessons learned. Retrieved from http://www.chcf.org/publications/2008/04/promoting-effective-selfmanagement-approaches-to-improve-chronic-disease-care-lessons-learned. Accessed July 2017.